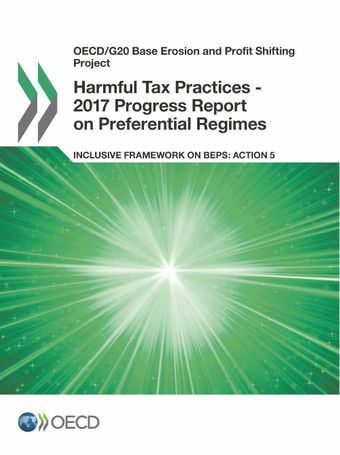 BEPS Action 5 is one of the four BEPS minimum standards that all Inclusive Framework members have committed to implement. 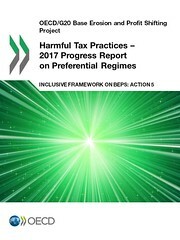 One part of the Action 5 minimum standard relates to preferential tax regimes where a peer review is undertaken to identify features of such regimes that can facilitate base erosion and profit shifting, and therefore have the potential to unfairly impact the tax base of other jurisdictions.This progress report is an update to the 2015 BEPS Action 5 report and contains the results of the review of all Inclusive Framework members' preferential tax regimes that have been identified. The results are reported as at October 2017.The report also contains guidance on preferential tax regimes, including timelines for amending regimes, how certain features of preferential regimes will be monitored, and guidance on the requirement that jurisdictions offering preferential regimes must require substantial activities to be undertaken in the regime. Substantial activities in non-IP regimes. In November 2018, the Inclusive Framework on BEPS approved updates to the results for regime reviews conducted in connection with BEPS Action 5. Please note that this was the last update to the 2017 Progress Report. Any new updates on regime results are now published in the 2018 Progress Report. The FHTP will continue its work, including to monitor and review preferential tax regimes which are being amended to conform to the Action 5 standard. The Action 5 minimum standard consists of two parts. One part relates to preferential tax regimes, where a peer review is undertaken to identify features of such regimes that can facilitate base erosion and profit shifting, and therefore have the potential to unfairly impact the tax base of other jurisdictions. The second part includes a commitment to transparency through the compulsory spontaneous exchange of relevant information on taxpayer-specific rulings which, in the absence of such information exchange, could give rise to BEPS concerns.